Rochester developer Marvin Maye lost his bid today to have a West Main Street church taken off the city's list of historic properties. Maye owns the church but wants to tear it down so he can build a Dollar General. The historic designation adds another hurdle for Maye to clear in his push to demolish the church. Westminster Presbyterian was built in 1870 and was later home to a German social and cultural society. 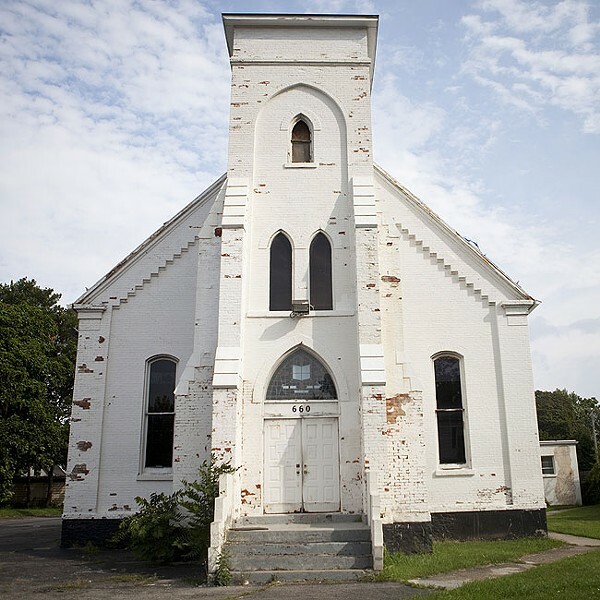 Arguing before the city's Zoning Board, a representative for Maye said that the church has deteriorated so badly that it is no longer eligible for the National Register of Historic Places. Since it lost that eligibility, Maye's representative said, it should come off the city's list, too. He also said that Maye has been unable to find tenants for the church. So if the city does not allow Maye's application to proceed, the representative said, it would essentially be forcing Maye to pay the approximately $600,000 it would cost to rehab the church without any prospective tenants in the wings. But unknown to Maye's team, the Landmark Society had reapplied to the state Office of Parks, Recreation and Historic Preservation and were notified Wednesday, March 20, that the church is once again eligible for the National Register. The church's architecture may be in bad shape, says a letter from the state office, but the church is still a significant part of Rochester's cultural history. The church is the one-time home of the German Liederkranz Club, one of only four surviving buildings "associated with the cultural history of Rochester's large German-American community in the 20th century," the letter says. The Landmark Society's Caitlin Meives broke the news about the National Register eligibility at this morning's meeting. The Landmark Society and the Susan B. Anthony Neighborhood Association have been fighting to save the church. The church is in an area of West Main that has seen a lot of revitalization, advocates say, and a Dollar General wouldn't fit in. Those in favor of tearing the church say the area needs the goods, the jobs, and that the building is an eyesore. In the end, the Zoning Board upheld the church's designation as a Building of Historic Value in the City of Rochester.